Automated Backup v2 automatically configures Managed Backup to Microsoft Azure for all existing and new databases on an Azure VM running SQL Server 2016/2017 Standard, Enterprise, or Developer editions. This enables you to configure regular database backups that utilize durable Azure blob storage. Automated Backup v2 depends on the SQL Server IaaS Agent Extension. 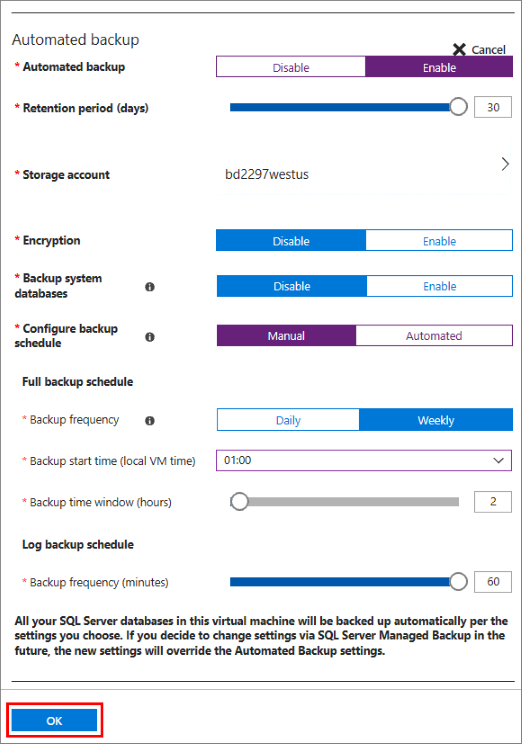 Automated Backup v2 works with SQL Server 2016 or higher. 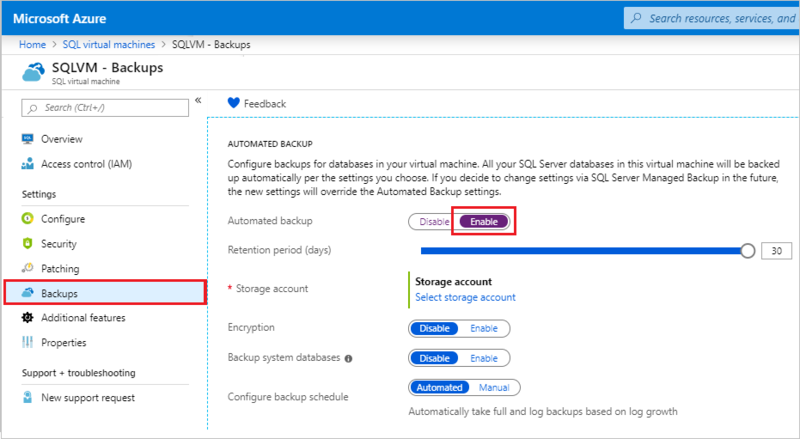 If you are using SQL Server 2014, you can use Automated Backup v1 to back up your databases. For more information, see Automated Backup for SQL Server 2014 Azure Virtual Machines. System databases do not have to use full recovery model. However, if you require log backups to be taken for Model or MSDB, you must use full recovery model. Target databases must be on the either the default SQL Server instance, or a properly installed named instance. The following table describes the options that can be configured for Automated Backup v2. The actual configuration steps vary depending on whether you use the Azure portal or Azure Windows PowerShell commands. 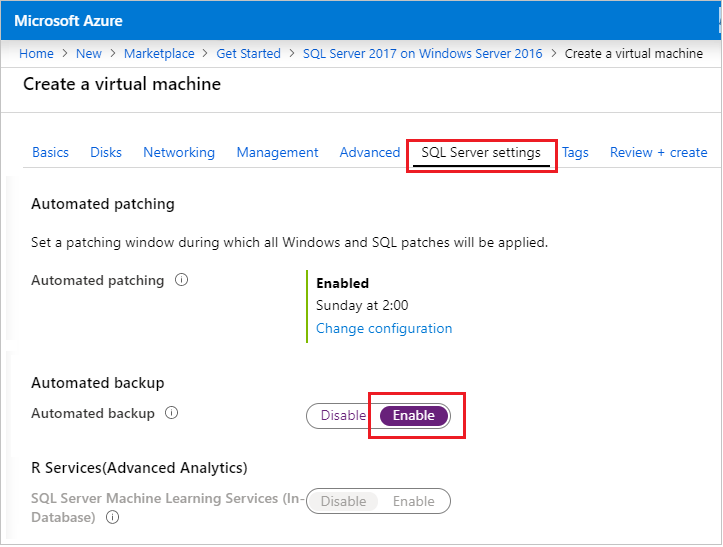 Automated Backup Enable/Disable (Disabled) Enables or disables Automated Backup for an Azure VM running SQL Server 2016/2017 Developer, Standard, or Enterprise. Retention Period 1-30 days (30 days) The number of days to retain backups. Storage Account Azure storage account An Azure storage account to use for storing Automated Backup files in blob storage. A container is created at this location to store all backup files. The backup file naming convention includes the date, time, and database GUID. Encryption Enable/Disable (Disabled) Enables or disables encryption. When encryption is enabled, the certificates used to restore the backup are located in the specified storage account. It uses the same automaticbackup container with the same naming convention. If the password changes, a new certificate is generated with that password, but the old certificate remains to restore prior backups. Password Password text A password for encryption keys. This password is only required if encryption is enabled. In order to restore an encrypted backup, you must have the correct password and related certificate that was used at the time the backup was taken. System Database Backups Enable/Disable (Disabled) When enabled, this feature also backs up the system databases: Master, MSDB, and Model. For the MSDB and Model databases, verify that they are in full recovery mode if you want log backups to be taken. Log backups are never taken for Master. And no backups are taken for TempDB. Backup Schedule Manual/Automated (Automated) By default, the backup schedule is automatically determined based on the log growth. Manual backup schedule allows the user to specify the time window for backups. In this case, backups only take place at the specified frequency and during the specified time window of a given day. Full backup frequency Daily/Weekly Frequency of full backups. In both cases, full backups begin during the next scheduled time window. When weekly is selected, backups could span multiple days until all databases have successfully backed up. Full backup start time 00:00 – 23:00 (01:00) Start time of a given day during which full backups can take place. Full backup time window 1 – 23 hours (1 hour) Duration of the time window of a given day during which full backups can take place. Log backup frequency 5 – 60 minutes (60 minutes) Frequency of log backups. It is important to understand the difference between daily and weekly full backups. Consider the following two example scenarios. You have a SQL Server VM that contains a number of large databases. This means that the next available backup window is Tuesday at 1 AM for 1 hour. At that time, Automated Backup begins backing up your databases one at a time. In this scenario, your databases are large enough that full backups complete for the first couple databases. However, after one hour not all of the databases have been backed up. When this happens, Automated Backup begins backing up the remaining databases the next day, Wednesday at 1 AM for one hour. If not all databases have been backed up in that time, it tries again the next day at the same time. This continues until all databases have been successfully backed up. After it reaches Tuesday again, Automated Backup begins backing up all databases again. This scenario shows that Automated Backup only operates within the specified time window, and each database is backed up once per week. This also shows that it is possible for backups to span multiple days in the case where it is not possible to complete all backups in a single day. This means that the next available backup window is Monday at 10 PM for 6 hours. At that time, Automated Backup begins backing up your databases one at a time. Then, on Tuesday at 10 for 6 hours, full backups of all databases start again. When scheduling daily backups, it is recommended that you schedule a wide time window to ensure all databases can be backed up within this time. This is especially important in the case where you have a large amount of data to back up. You can use the Azure portal to configure Automated Backup v2 during provisioning or for existing SQL Server 2016/2017 VMs. Use the Azure portal to configure Automated Backup v2 when you create a new SQL Server 2016 or 2017 Virtual Machine in the Resource Manager deployment model. Automated Backup v2 is disabled by default. In the SQL Server configuration settings, click the Edit button in the Automated backup section. If you are enabling Automated Backup for the first time, Azure configures the SQL Server IaaS Agent in the background. During this time, the Azure portal might not show that Automated Backup is configured. Wait several minutes for the agent to be installed, configured. After that, the Azure portal will reflect the new settings. Then use the New-AzVMSqlServerAutoBackupConfig command to enable and configure the Automated Backup v2 settings to store backups in the Azure storage account. In this example, the backups are set to be retained for 10 days. System database backups are enabled. Full backups are scheduled for weekly with a time window starting at 20:00 for two hours. Log backups are scheduled for every 30 minutes. The second command, Set-AzVMSqlServerExtension, updates the specified Azure VM with these settings. To monitor Automated Backup on SQL Server 2016/2017, you have two main options. Because Automated Backup uses the SQL Server Managed Backup feature, the same monitoring techniques apply to both. First, you can poll the status by calling msdb.managed_backup.sp_get_backup_diagnostics. Or query the msdb.managed_backup.fn_get_health_status table valued function. Call the msdb.managed_backup.sp_set_parameter stored procedure to assign an email address to the SSMBackup2WANotificationEmailIds parameter. Automated Backup v2 configures Managed Backup on Azure VMs. So it is important to review the documentation for Managed Backup to understand the behavior and implications.